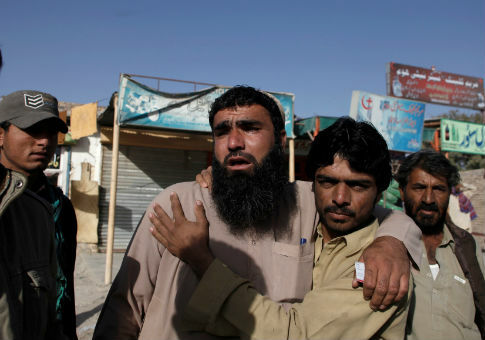 QUETTA, Pakistan (Reuters)–Militant group Islamic State said on Tuesday that fighters loyal to its movement attacked a police training college in Quetta in southwest Pakistan in a raid that officials said killed 59 people and wounded more than 100. Prime Minister Nawaz Sharif and Army chief General Raheel Sharif traveled to Quetta and took part in a special security meeting on Tuesday afternoon, the prime minister's office said. Authorities launched a crackdown against LeJ last year, particularly in Punjab province. In a blow to the organization, Malik Ishaq, the group's leader, was killed in July 2015 with 13 members of the central leadership in what police say was a failed escape attempt. Islamic State, which established a self-proclaimed Muslim caliphate in parts of Iraq and Syria, has sought to make inroads over the past year, hoping to exploit Pakistan‘s sectarian divisions. "I was asleep, my friends were there as well, and we took cover under the beds," one unidentified cadet told Geo TV. "My friends were shot, but I only received a [small] wound on my head." Officials said the attackers targeted the center's hostel, where 200-250 police recruits were resting. At least three explosions were reported at the scene by media. "Our problem is that when an attack happens, we are alert for a week after, ten days later, until 20 days pass, [but] then it goes back to business as usual," he said. This entry was posted in National Security and tagged ISIS, Islamic State, Pakistan, Terrorism. Bookmark the permalink.